Beneath fields of corn and soybeans across the U.S. Midwest lies an unseen network of underground pipes. These systems, which are known as tile drainage networks, channel excess water out of soil and carry it to lakes, streams and rivers. There are over 38 million acres of tile drainage in the Corn Belt states. These networks play a vital role in farm production. They allow farmers to drive tractors into fields that would otherwise be too wet and make it possible to plant early in spring. And they boost crop growth and yield by preventing fields from becoming waterlogged. But drainage systems are also major contributors to water pollution. The water they remove from fields contains nitrogen, which comes both from organic matter in rich Midwestern soil and from fertilizer. This nitrogen over-fertilizes downstream water bodies, causing blooms of algae. When the algae die, bacteria decompose them, using oxygen in the water as fuel. The result is hypoxic zones, also known as dead zones, where nothing can live. 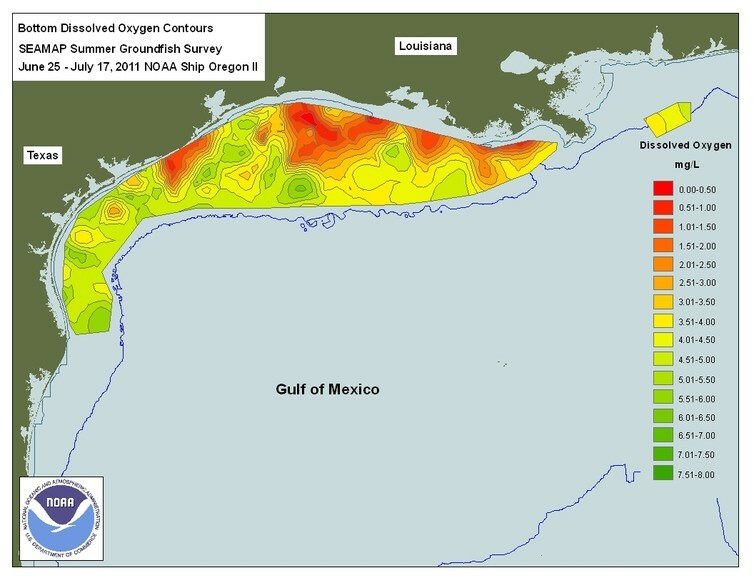 Some of these zones, such as the one that forms in the Gulf of Mexico every year fed by Midwestern farm drainage water, cover thousands of miles. Across the Midwest and in many other areas, we need to reduce nitrogen pollution on a very large scale to improve water quality. My research focuses on woodchip bioreactors – simple trenches that can be constructed on farms to clean the water that flows out of tile drains. This is a proven practice that is ready for broad-scale implementation. Nevertheless, there is still great potential to improve how well wood chip bioreactors work, and to convince farmers to use them through additional research and engagement. Researchers studying ways to improve agricultural water quality have shown that we can use a natural process called denitrification to treat subsurface drainage water on farms. It relies on bacteria found in soil around the world to convert nitrate – the form of nitrogen in farm drainage water – to nitrogen gas, which is environmentally benign and makes up more than three-fourths of the air we breathe. These bacteria use carbon as a food source. In oxygen-free conditions, such as wetlands or soggy soils, they are fueled by carbon in the surrounding soil, and inhale nitrate while exhaling nitrogen gas. 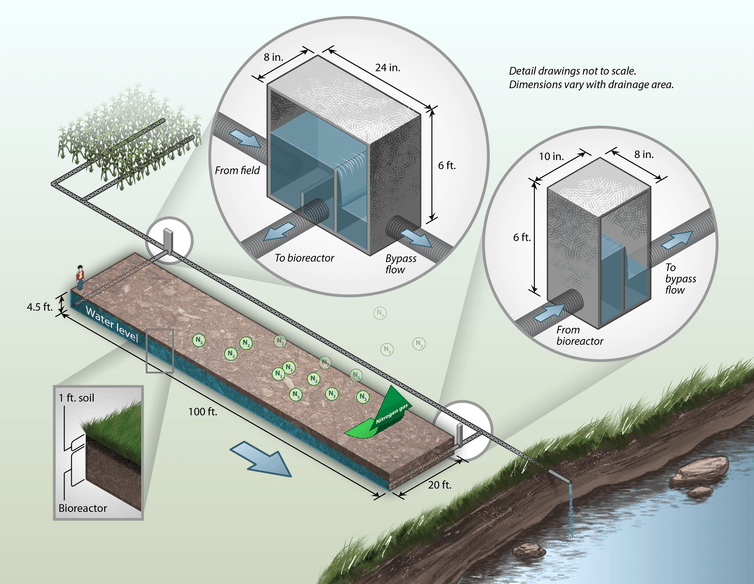 Bioreactors are engineered environments that take advantage of their work on a large scale. Denitrifying bioreactors on farms are surprisingly simple. To make them we dig trenches between farm fields and the outlets where water flows from tile drains into ditches or streams. We fill them with wood chips, which are colonized by native bacteria from the surrounding soil, and then route water from farm drainage systems through the trenches. The bacteria “eat” the carbon in the wood chips, “inhale” the nitrate in the water, and “exhale” nitrogen gas. In the process, they reduce nitrogen pollution in water flowing off of the farm by anywhere from 15 percent to over 90 percent. Although denitrifying bioreactors are relatively new, they have moved beyond proof of concept. A new special collection of papers in the Journal of Environmental Quality, which I co-edited with Dr. Louis Schipper of the University of Waikato in New Zealand, demonstrates that these systems can now be considered an effective tool to reduce pollution in nitrate-laden waters. Researchers are using these systems in an expanding range of locations, applications, and environmental conditions. Woodchip bioreactors can be installed without requiring farmers to take land out of production, and require very little annual maintenance. These are important selling points for farmers. The Clean Water Act does not regulate nitrogen pollution from diffuse agricultural sources such as farm runoff, but states across the Midwest are working with federal regulators to set targets for reducing nitrogen pollution. They also are developing water quality strategies that call for installing tens of thousands of denitrifying bioreactors to help reach those targets. So far, wood chips have proven to be the most practical bioreactor fill. Research at the lab scale has also analyzed the idea of using farm residues such as corn cobs instead. In laboratory studies, such agricultural residues consistently provide much higher nitrate removal rates than wood chips. However, they need to be replaced more frequently than wood chips, which have an estimated design life of 10 years in a bioreactor. Laboratory studies have also helped us understand how other factors influence nitrate removal in bioreactors, including water temperature and the length of time that water remains inside the bioreactor – which, in turn, depends on the flow rate and the size of the bioreactor. Another challenge is that bioreactors work best in late summer, when drainage flow rates are low and the water flowing from fields is warm, but most nitrogen flows from fields in drainage water in spring, when conditions are cool and wet. Researchers are working to design bioreactors that can overcome this disconnect. We have also carried out tests to see whether bioreactors can treat aquaculture wastewater, which typically contains much higher levels of nitrate and other water pollutants than tile drainage water. Our study showed that bioreactors could be a viable low-cost water treatment option for fish farms. And researchers from New Zealand recently showed that denitrifying bioreactors may be an effective option for treating some small sources of municipal wastewater. Their workprovided the first indication that woodchip bioreactors may be able to remove microbial contaminants like E.coli and viruses, which can be hazardous to human health, from water. The exact process by which the E.coli and viruses were removed is not yet known. One difficult challenge in designing denitrifying bioreactors is testing novel designs at the field scale. We need to build and test large bioreactors so that we can provide useful information to farmers, landowners, crop advisors, drainage contractors, conservation staff, and state and federal agencies. They want to know practical facts, such as how long the wood chips last (approximately 7-15 years), how much it costs to install a field-scale bioreactor ($8,000-$12,000), and whether bioreactors back up water in tile drainage systems (no). To refine what we know, we plan to continue installing full-size bioreactors either on research farms or by collaborating with private farmers who want to be at the cutting edge of water-quality solutions. We all play a role in agriculture because we all eat, and at the same time, we all need clean water. 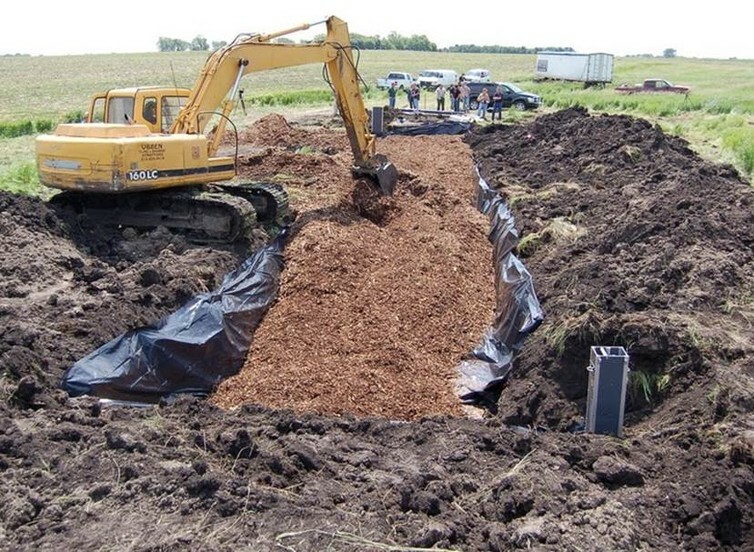 Simple technologies like woodchip bioreactors can help meet both goals by helping farmers maintain good drainage and providing cleaner water downstream. Stream Ecosystems in a Changing Environment synthesizes the current understanding of stream ecosystem ecology, emphasizing nutrient cycling and carbon dynamics, and providing a forward-looking perspective regarding the response of stream ecosystems to environmental change. Estuarine Ecohydrology, Second Edition, provides an ecohydrology viewpoint of an estuary as an ecosystem by focusing on its principal components, the river, the estuarine waters, the sediment, the nutrients, the wetlands, the oceanic influence, and the aquatic food web, as well as models of the health of an estuary ecosystem.